Don’t call writing hard. Write it now. When I watched the wonderful movie The Sessions, I saw the story of Mark O’Brien, a poet who contracted polio as a boy but kept on writing. Kept writing even though he’d lost the control of all of his muscles, except those in his face. 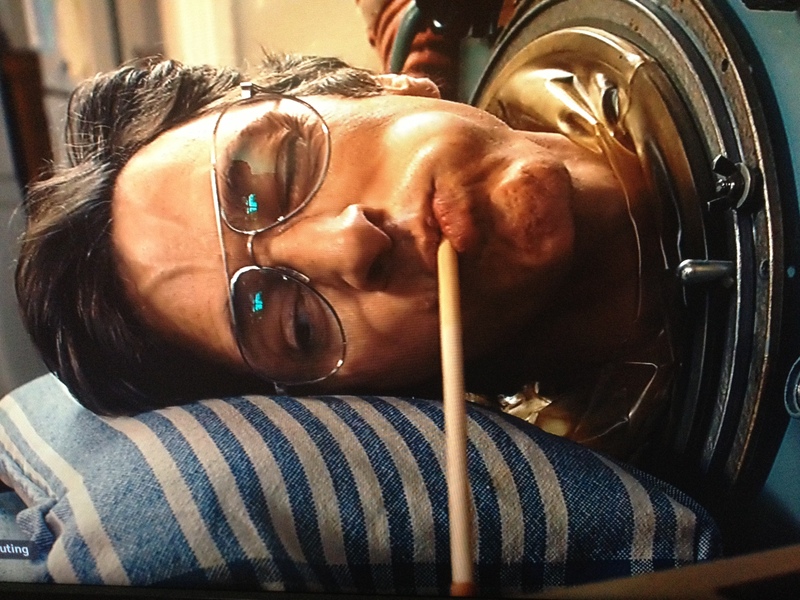 He lived in an iron lung. He held a pencil with a fat eraser in his mouth, then tapped the keys on his typewriter, or later on, a keyboard on a computer, once those became popular in the 1980s. No matter what’s happening in your writing, you and I don’t have that hurdle to overcome. 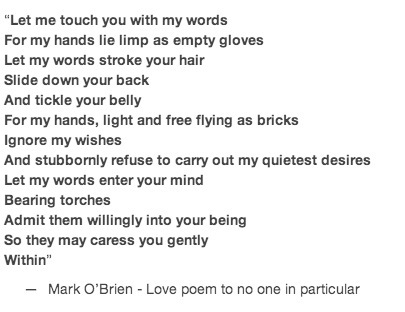 O’Brien published many articles and essays – he worked as a journalist as well as a poet – and released three books of poetry. Watching this man write in The Sessions, I realized I would never be able to complain again about how hard it is to write. Revision is another matter. I can’t even start to wonder how he managed that. But you won’t have your writing published without revising it. On the other hand, there’ll be no revising without the writing, simple first drafts. So write now. Because you need to do it before something else might stop you. March 5 is the birthday of Karen Stolz. Or it would be, if she were still alive. She was a writing teacher of mine in the years when I just started to study fiction. Karen passed away in 2011 at age 54, felled by heart failure. She had a big heart, enough to embrace people new to writing or new to fiction. She taught a class at St. Edwards attended by my brother-in-law Billy, a bank robber, gambler and storyteller extraordinaire. Billy’s stories arrived at my house inside letters from prison to my wife. Karen called him a good writer. Billy was writing because he had nothing but time. Karen wrote her bestselling novel in stories, The World of Pies, because it was her time to move up from her short stories. Those stories got her into the Iowa Writer’s Workshop. She moved back to her hometown in Kansas after her son graduated high school, where she taught writing at Pittsburg State. Karen had published a second novel by then, Fanny and Sue, and was working on a third, looking for a publisher. Like anybody taken early from life, she figured she had more time to write. But unlike many writers, she wrote sooner – while her son was still in school – rather than later, when she’d have more time. It was a smart choice, and one we can make for ourselves, too. Even if your writing is only blog entries right now, or 20 minutes at a time in a workshop meeting, choose to do it now. Let your voice be heard and enjoyed by the world. There’s a great interview with Stephanie Meyer in Entertainment Weekly’s Web site. The best-selling author of the Twilight series of teen vampire love said that being this successful — first three books becoming movies, fans clamoring for more writing — has blocked her on the project. Everyone now is in the driver’s seat, where they can make judgment calls. ”Well, I think this should happen, I think she should do this.” I do not feel alone with the manuscript. And I cannot write when I don’t feel alone. So my goal is to go for, like, I don’t know, two years without ever hearing the words Midnight Sun. And once I’m pretty sure that everyone’s forgotten about it, I think I’ll be able to get to the place where I’m alone with it again. Then I’ll be able to sneak in and work on it again. While you work on your first book, you can be alone. But once a book hits with the splash that Twilight gave to Meyer, you’ll never be alone again. This is the business side of writing, the one that creates fans, makes you a celebrity and rich. Meyer is about the same age as J.K. Rowling was when Harry Potter ascended. But the Twilight empire has emerged much faster (some say the writing is a little under-baked) and this is Meyer’s first dance in the limelight. She talks of a new project she wants to work on that revolves around mermaids. You can look back at the movie careers of Quentin Tarantino, Orson Wells, even Kevin Smith after Clerks to see the challenge. The limelight was so hot that their second act was where the twilight fell on them. You can climb back to the light, but it helps to be able to foresake the fame and quiet all those voices. An artist has to stay true to their own voice. If not, then your romance in the world of vampires might be dead to you. Of course, that should be “expectations of men,” but it’s only English written by 266,000 fans in the group. This is fame and fun we’re witnessing. And after 29 million copies sold, it would seem we’re all witnessing. Wilder’s directoral choices reflected his belief in the primacy of writing. He avoided the exuberant cinematography of Alfred Hitchcock and Orson Welles because, in Wilder’s opinion, shots that called attention to themselves would distract the audience from the story. Wilder’s pictures have tight plotting and memorable dialogue. Wilder’s best storytelling is all over the map in subject matter, from the wordplay screwball comedy in Ball of Fire to the film noir groundbreaker Double Indemnity to the grit of Hollywood in Sunset Boulevard. Most serious? Alcoholism, in The Lost Weekend, which earned him two of those Oscars. And then there’s Some Like it Hot, where he introduced the world of 1959 to the humor of cross-dressing. A hidden gem is Ace in the Hole, where Kirk Douglas growls his way through a media circus of his own creation: he’s a reporter — like Wilder once was — trying to get back into a $1,000 a week job. You can see a succinct 90 seconds of his story theory in a film clip on the NPR Web site (Real Player is required). Wilder died in 2002, but before he moved on to the next level of storytelling he left behind his 10 rules of story; nearly all of them can be applied to genre, literature or movies. 1. The audience is fickle. 2. Grab ’em by the throat and never let ’em go. 3. Develop a clean line of action for your leading character. 4. Know where you’re going. 5. The more subtle and elegant you are in hiding your plot points, the better you are as a writer. 6. If you have a problem with the third act, the real problem is in the first act. 7. A tip from Lubitsch: Let the audience add up two plus two. They’ll love you forever. 8. In doing voice-overs, be careful not to describe what the audience already sees. Add to what they’re seeing. 9. The event that occurs at the second act curtain triggers the end of the movie. 10. The third act must build, build, build in tempo and action until the last event, and then — that’s it. Don’t hang around.